Why? Like mountain climbers say: because it's there. As an environmental nut, I don't like to throw away things that still work. But I have a PCMCIA network card and I would rather not have to hunt down and install 10 year old drivers to get it to work with Windows 95. The latest Linux definitely supports more hardware out of the box than Windows 95. 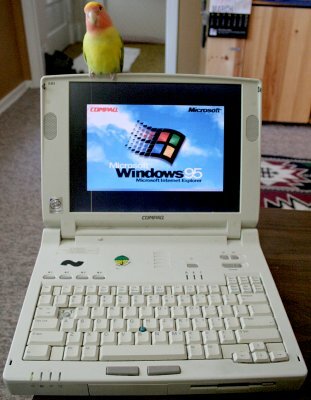 I don't know very much about this laptop. I recall that the system information utility in Windows 95 is "MSD" or "MSDIAG", but either didn't exist in this installation, or my memory is faulty and I was typing the wrong command. The only thing I do know is that it has 32 MB of RAM, integrated stereo sound and modem, no network card, and no CDROM drive. When it boots, there is no obvious way to enter the BIOS utility. I tried DEL, F8, etc but I figure it doesn't have one. I tried really hard to install Ubuntu, which I am familiar with on my other machines. The problem is that Ubuntu has removed the ability to install it from floppies. You have to a) use the CDROM or b) do a network boot. I wasted hours trying to do the network boot, which I have done before for the machine running this web server (The DELL DVD drive died long ago). I followed the instructions to put the network boot CDROM onto another Linux server, and installed TFTP and a DHCP server. But the ancient Compaq laptop presented a problem. Normally you could go to http://rom-o-matic.net/ and make a boot floppy, which will boot up, detect the network interface, and then do a network boot (which would start the Ubuntu installer). However, the only network card I had was a PCMCIA 3com card that is supposed to be supported by rom-o-matic. But no matter what I did, etherboot would not detect it and would just sit there dumbly. It may have been possible to use the PLIP (IP over parallel port networking) option and boot from over the network using a special cable. But I don't have the cable, and such an install is so uncommon, it would be a miracle if it worked at all. After some research I found that Debian still supports the floppy install option. All you need are 4 floppies for boot.img, root.img, and two additional disks of network drivers. Of course, I only own one floppy disk so I had to keep re-imaging it during the install. The minimum memory required for installation is 32 MB, so we are in luck. The problem is that the installer enters a "low memory mode" and doesn't load any kernel modules on its own. Instead, it pops up a list and you have to guess what drivers you are going to need. If you are wrong, you can always click "go back" to back up. I went through the four floppy disks that it asked for, and selected anything that looked like IDE (for the hard drive), 3COM, and PCMCIA (for the network card). Actually, at first I didn't select the IDE components. As a result, the installer offered to partition my floppy disk. I went back to add in the hard disk drivers. Finally, the installer was working. It connected to the network and downloaded and installed the minimum debian distribution. The only changes I made were to the partitioning. Initially, it offered a 90 MB swap partition. That seems small, so I increased it to 400 MB, leaving 1.3 GB of disk space left over for the install. The installer seemed to freeze at one stage, while "preparing installation report." I rebooted the machine and it worked the second time. When the laptop boots up, I get lots of kernel messages about failed I/O operations. However, once it starts everything is okay. I did a surface check using e2fsck -c but the errors persist. Once everything was set up, I installed gvim, xdm, Xorg, and icewm, (which is a great window manager that doesn't take up too much space). When I started X for the first time, the screen was red and didn't look right. It turns out that I had to limit it to 16-bit and reduce the resolution to 800x600, the native resolution of the screen. Then everything worked. It turns out that Firefox is a memory pig. It took 15 minutes to start, and it takes up over 100 MB of memory to show a blank window. Ugh! There isn't a lot of choice of browsers out there. Galeon is part of Gnome, and I definitely didn't want any bloated Gnome packages on my lean but slow machine. Instead, I downloaded the latest version of Opera. Opera starts in only 10 seconds or so. It's usable, if you don't mind waiting a few seconds between clicks. So Opera wins the browser wars for low-resource machines. Since the laptop is so slow to use, I mostly use it to connect to other machines using xtightvncviewer. For this purpose, it works very well. For old machines with no CD-ROM drive, you are better off installing Debian than Ubuntu. Because of Debian's low-memory mode installer, you'd better be a computer expert to pick the right drivers during installation. The best package manager is "aptitude", but only when run from the command line, because even the text-based GUI is too slow. It keeps stopping everytime you do something to do housekeeping. The best browser for low-resource machines is Opera. Aside from a minor hiccup with X.org's graphics detection, all hardware works flawlessly. Try midori as a web browser. Correction it has a 3.5 floppy drive. Will it work on my Windows 3.1 laptop? It does have a 3x5 floppy drive and an 80mb hard drive with only 4mb of ram. I was going to install Windows 95 as a last resort. I just did something similar last weekend. I had an old Dell laptop with PIII 400 MHz and 256 MB of RAM. This meets the minimum requirements for recent Ubuntu versions, but I found the installer would hang. I had to boot from CD-ROM, because it had no USB booting, and I didn't want to bother with floppies or networks. I even tried Lubuntu (a lightweight Ubuntu) but had the same installer issues. In the end, I used the minimal CD to install a command line system, then used aptitude to install LXDE (a lightweight graphical environment) and the Chromium browser. It seems to work fine for basic web browsing. I guess you'd better install either some old linux or some of these new linuxes, but conceived for old machines, rather than the latest debian and all the semi-latest software that comes with it. Is opera the best browser(for old machines)? What about Skipstone or NetSurf? I think they are great. They will probably not crash as much as opera. Once Skipstone crashed, but then I had about 30 windows open on a computer with 64 mb ram. Can you do that in opera? I had a similar problem with a old laptop of mine. Wouldn't boot from a CD, had no floppy port and was before USB booting. I took out the harddisk, installed ubuntu on it and shoved it back in. Good as new. Im trying to get the proper pragraming floppy dics to get a 1990 Compac laptop working agin but dont really know where to get one. Can you help? Check out Dillo instead of Opera, its a fast little browser written in c++ & c, only problem it does not support flash or css, you can find it at Dillo.org, and what about a few screenshots ? Yes, Debian > Ubuntu for sure. I had done that with netbsd: you can have a network connection through the serial port, i think I had to recompile the kernel of the launch disk to have that. I've used Linux on a 90MHz/24MB compaq since I got it second hand 8 years ago, and it has been quite useful. You have to make sure to use apps that eat only very little of memory.. so things like Gnome desktop was out of question, but Opera and a minimal window manager are cool in deed. Compared to those, a "modern" (6 years old) 1500MHz / 512MB laptop is a bliss, because you can throw in a latest distro and not even care what useless stuff it loads to background. Very cool! Have you tried a machine with less than 32Meg? I have an old AST laptop with 20megs of RAM, but I can't find any way to install debian 4.0. I have an old install of debian 3.0 on it already. I'd like to dist-upgrade it, but I was never able to get the PCMCIA NIC to work with 3.0. That is really cool. You should be proud of all the hard work you did and have saved one laptop from the landfill.